This blog post was first published in 2014, but is as timely as ever. Enjoy! Although I’m far from ever being labeled as “shy,” I still have to gather my courage before speaking up for myself. Why? I think it’s simply human nature to want to smooth things over and not make waves. I look back on times and events that I regret in my life, and I mostly identify when I did not speak up for myself or my children. The fourth grade teacher who was consistently negative and oddly punitive towards my son. I once asked her if she had anything positive to say about my son, and she simply stared me down without saying a word. All the other parents said she was “a great teacher, if you have a girl.” (Just writing about it makes me white hot with rage!) And by the way, her main complaint about my son was that he wiggled in his seat and looked out the window. But I’m older and wiser now, and realize that addressing the issues with the teacher wasa battle I should have chosen. But at the time, I feared she would be even worse to my son if I confronted her with my concerns. I deeply regret this. Luckily, my current life is pretty smooth, although there still seem to be times when I have to take a deep breath, gather my courage and speak my mind. I went in for my annual work evaluation yesterday. The paperwork goes into my human resources file, and is as close to that dreaded permanent record as is likely at this phase of my life. Although I’ve been in the same hospital-based RN job for 19 years, these meetings always give me a case of the jitters. I sat down and noticed that I was being being marked as having “met” rather than “exceeded” at my job. And although “met” is considered perfectly acceptable, I felt the need to speak up. I explained to my boss, (who is kept busy with meetings, and doesn’t ever see me in action) that I felt that I earned the “exceeded” label. That I hold myself to a very high standard, that I work to support a positive work environment and that I try to be the nurse I wish I was working with. She listened to what I said, and then changed my rating. It made me nervous to speak up for myself, but I did it anyway. And this morning, I sat down to read through my e-mails, and sent out three very carefully worded e-mails that I would have much preferred to procrastinate or simply delete. Emails that required me to bypass my natural inclination to shy away from sticking up for myself. But because they were in written form, none will be the wiser that my voice was shaking; but yes, it was. How does this relate to non-consumerism? By choosing a less traditional life, there are inevitable uncomfortable conversations. Whether it’s telling a family member that you want to tone down Christmas or simply declining expensive invitations. Or even just living a simple life that sometimes does require you to explain your decisions, even when it’s no one’s business but your own. 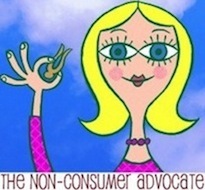 So please non-consumers, speak your mind. Even if your voice shakes. Very true. It’s okay to go against the flow, especially if something bothers you. I’m pretty introverted so I’m always inclined to just leave things be. But there are soooo many times when I should stick up for myself and I don’t. The result is a life with lots of little regrets, and that’s not fun. I appreciate it that you spoke your mind about your feelings regarding the election, and that you marched this past Saturday. I don’t want to stir up a political hornets nest, but I admire and respect individuals who stand up for their rights and/or infractions against them. There are a several commercial artist, Mary Englebreit and Susan Branch comes to mind, and a couple companies, Penzey Spices for one, spoke their minds about the recent election, in spite of the fact there could have been strong backlash just because they spoke their minds. I actually think the opposite is true and they have gained more support and loyalty by being honest. So thank you for being honest with us. I realize you have something to lose too, but I truly appreciate your opinion. Peace be with you. Lorraine, I agree with everything you said. I’ve tried my best to keep what little money I spend out of the coffers of companies that endorse exclusion. I’ve done this since I got my first “real” job at 16 before I practiced non-consumerism I was and still am a “politicized consumer”. I was very shy and am still very introverted and non-confrontational. I’ve always had an easier time sticking up for other people but I’m important too and it’s something I have to occasionally remind myself of. Lorraine, that’s so interesting about Penzeys Spices. I love that company and in fact, just last night was telling a friend about their great spices and stories. But I had NO idea that they spoke their mind about the election. That just makes me love them more! Truth- just watched the Channel 4 news here.UK. Reporting from the White House.Alternative… Thank you so much for your veracity, courage and humour-the best of all voices. Never commented before but have enjoyed and felt a fraud not too, given what is happening here and on your side of the pond-in British parlance.Thank You. I usually speak my mind. I try not to be argumentative or mean. However, there are times when I just walk away. Confrontation does not always end with resolution. The trick is trying to figure out which situation I am in. I think that I guess correctly — most of the time. I don’t like to speak my mind; I like pour water on the waves, make everything smooth and easy. But I have found that my daughter emulates me, and is hesitant to speak her opinion. Instead, she’d rather go along and make everyone else/her brother rather than say what she wants. So I have been working on speaking up. It is HARD, but nothing worth accomplishing is easy. I too have regrets about times when I did not speak up for myself or my children. A couple of these incidents still bother me even though they happened years ago. Now that I am older, I am much better at speaking up, but I wish I had learned this skill years ago. Boy, I have the opposite problem: I cannot keep my mouth shut. My parents were both in concentration camps in their teens and one thing my father drilled into me was that surviving meant you had an obligation to stand up against tyranny—any kind, including bullying. And that because he survived to have children, his children were obligated to fight in order to justify his survival. Even as kids we were encouraged to challenge my parents if we thought things they were doing were unfair; he always said, “I am not raising you to be easy children but to be strong adults.” I think he sometimes regretted it because we were a questioning, rowdy bunch, but in the end he was proud to see us standing up for the voiceless or vulnerable. I am blessed to have a husband who likes my outspokenness, while at the same time being willing to tell me if he thinks I could have been more effective if less confrontational. I like to think I have reached a better balance, sometimes more successfully than others. There have been times when I have attacked when a more measured responses would have been more effective and helped my cause better. A loud mouth can be as much of a liability as a timid one. I love you father’s words! What an amazing story! You are a living legacy. Wow, thank you for sharing your background. A different perspective, indeed. I am very grateful and appreciative that you speak up, especially about the crucial events in our country right now. Your voice has a wide reach and it matters. Thank you for sharing this with us, Katy. I see you as a very brave person, so it’s encouraging to hear that you have to muster up strength before you speak your mind. I learned the hard way to speak up for myself and my family, since I tend to lean towards being an introvert. You’re right, there are many hard conversations in life, but we need to have them to keep from being used as doormats or simply passed over because we’re quiet. My problem: I get angry and too often want to speak my mind before I think about what or how I’m saying something. I’ve learned when I get angry to write down what I want to say and then edit it, so I stick to the facts and don’t become too emotional. As I’ve gotten older, I care less about what people think and more about maintaining integrity and sticking up for myself and my family. I like open communication. It’s not very popular and seems to be getting even less so. When government tries to shut down news and information so blantantly, the EPA the latest office ordered to silence, I know I will need to make personal decisions and I’m not sure what those will be. It’s good to know I need very little to exist. I may need to brush up on my Ghandi. Thank you for introducing me to Maggie Kuhn. I look forward to learning more about this remarkable woman and her contributions to the lives of women and the elderly.